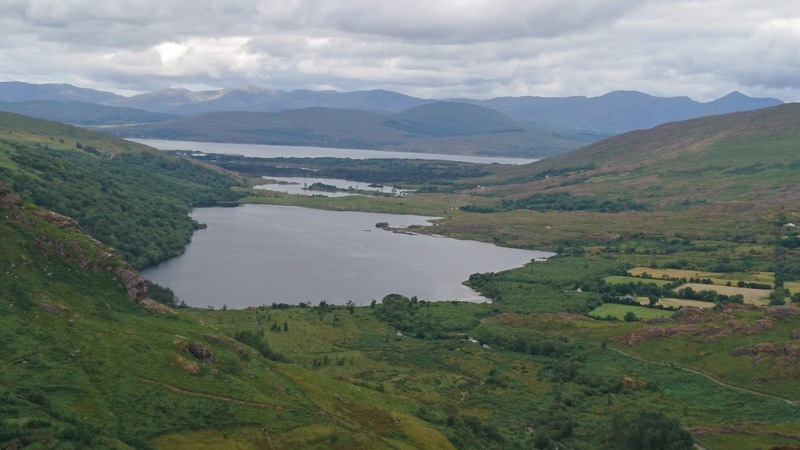 The club outing on Sunday 29 July was to Gleninchaquin Park in the north west side of the beautiful Beara Peninsula. We left town at 08.00 in some what overcast conditions, with a smattering of rain. Undaunted we travelled west towards Barraduff. Turning for Glenflesk then through Healy Rea country . We stopped in Kenmare for coffee / tea and to stretch our legs. Refreshed we carried on. Turning left after a few miles into Gleninchiquin Valley. This long narrow coomb valley was formed approx 70000 years ago by glaciers. The roadway into the head of the valley is a winding torturous route, a test of driving skills which thankfully all our drivers passed with flying colors. 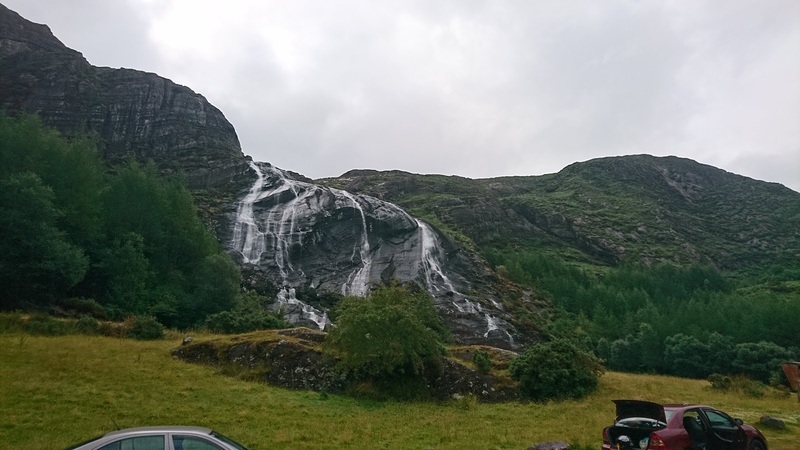 By now the weather had brightened, and with Cloonee Loughs and Inchaquin lake to our right and the majestic 140 meter waterfall tumbling down to the valley floor in front of us, we knew we were in for a treat. After the recent rain the waterfall was in full spate. Reaching the car park we changed into our gear and followed the yellow route ( Upper valley route). This took us across the stream at the bottom of the waterfall, that feeds the lakes we passed on our way in. Gleninchiquin is a remote valley with no access for tour busses , so it is not over run by camera toting yanks...Our route took us upwards into the mountains above the waterfall. As we gained height the views opened up across to Kenmare Bay and the Macgillycuddy Reeks. Below us the valley floor with its verdant fields and brooding lakes...The weather was perfect for walking and visibility was excellent. Conditions underfoot varied from stoney tracks to boggy ground and everything in between. Parts of it were on exposed rock and could be slippery. The trail was well way marked, except at the start which was marked out for the red trail only. However when you reached where the red and yellow trail diverged it was well marked from here. The route went up hill and down hill each step unfolding incredible views, over the Caha Mountains, and the Beara Peninsula. We stopped for some welcome refreshments, and feasted our eyes on the scenery. A table with a view. Onwards we went, finally we began to descend a series of stone steps, which after sometime brought us to the gate that leads to the river walk. This delightful walk meanders through woodland,by a stream gushing down through a series of mini waterfalls and rock pools. Leaving the river walk we reached the lane which took us to the car park. Gleninchiquin Park is a privately owned and has been open for fifteen years. The family that own it have been farming here for five generations over 130 years. It’s an idyllic place that hasn’t suffered from over exploitation. We decided to stop at Foleys in Kenmare for food. It was an excellent choice. The food here was delicious. The only downer was that after an epic battle with Limerick, Cork bowed out of the championship.